Users get improved controls, and can decide what other people see in the latest version of the PDF manipulation and markup tool. PDFpen 9.1 and its sister app PDFpenPro 9.1 really let you tear apart PDFs. You can add in pages and you can redact things you don't want people to see. Impressively, you can change the text in the PDF. So, if you've made one typo in a report or one price has changed in a sales document, you can fix it there instead of going back to Word or InDesign to start again. 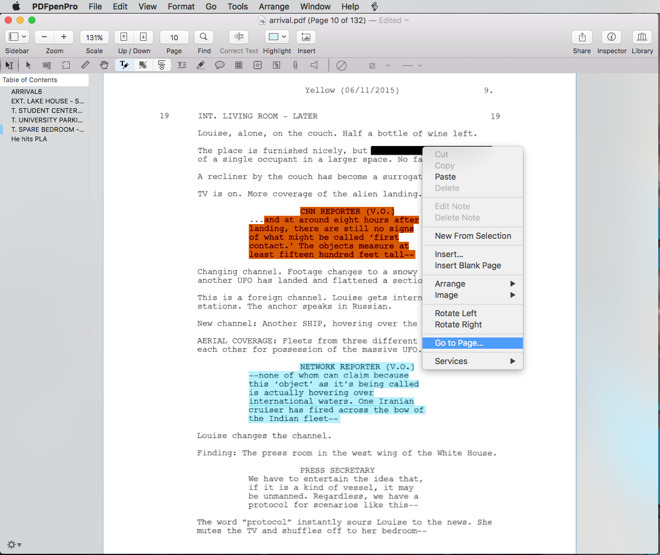 This new release of PDFpen 9 and PDFpenPro 9 for Mac adds to all of these features. It gives you extra ways to export your PDF before sending it to someone so that now you can also just email them a JPEG image to read, for instance. Nicely, it also now lets you take away a feature. PDFpen will perform optical character recognition on a document for you and that lets you do all sorts of things from making a Table of Contents to doing searches and edits on the text. You want that, but often you don't want your recipients to be able to alter the text. So now you can switch off what's called the OCR layer and they get a regular PDF instead. There's little to stop them then running it through PDFpen themselves and OCRing it all over again, but most recipients don't know you can do this. Plus the rest can become PDFpen users. Whether you're editing a PDF for other people or marking up one for yourself, there are now improved options for adding annotations. If you add a note to a PDF page, it shows as a speech bubble and now hovering over that will show you the text of your note. There's an annotations sidebar that shows the start of each note or text comment and you can also see the text there. You can't edit it in that sidebar but you can double-click to open the annotation in place and make changes there. Both versions of the app let you highlight a word or sentence or title in your PDF and mark that as a contents entry to build up the Table of Contents. However, while it lets you build up a quick way to jump around the document, it's not very satisfactory. You use it by selecting that word or whatever after the document has been OCRd. Select the text and choose Add Entry via the Table of Contents sidebar or keystroke. That's fine and quick enough when you know the keystroke but the text captured for the entry may not be complete or right. For instance, when we selected the title Arrival from that film's PDF screenplay, PDFpenPro 9 saved it in the Table of Contents as "Arrival6". 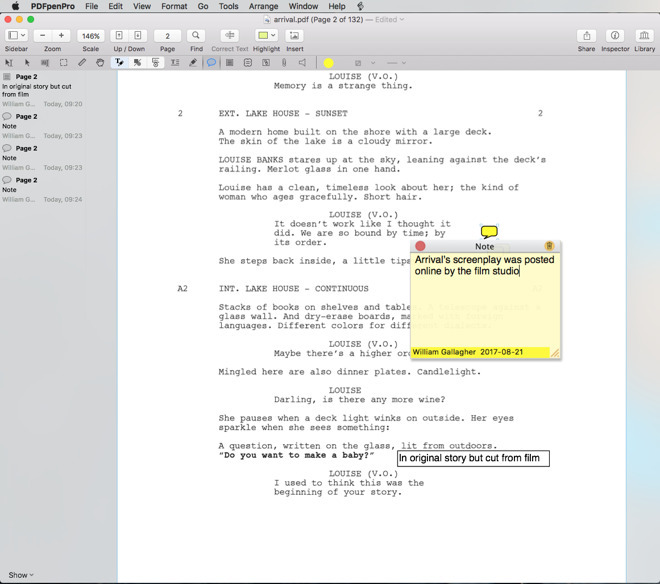 Similarly, it's a screenplay so we were marking different scenes for the contents and those all begin either INT. or EXT. but PDFpen 9 would often ignore the first two letters. So scenes would be saved beginning "T.". Our best guess on Arrival6 is that it's an OCR error but then we had previously done something like five Table of Contents entries -and lost them all. PDFpen presumes you want to OCR one page at a time and so we'd go to make an entry and would have to wait while it did that scanning. Later we found out how to force it to do the whole document - you have to hold down Command and Option while choosing the OCR menu item - and that erased all our previous entries. If you've scanned a document rather than just opened one that, for instance, film studios release online, then PDFpen will detect that it's a scan and will offer to OCR the whole document. That's better. We'd prefer whole document scanning to be the default in the menus, though, or at least for us to not have to search online for the keystroke. Nonetheless, making a Table of Contents and marking up notes and annotations does make PDFpen a comprehensive and useful tool. You can probably do more if you buy Adobe's official Acrobat software and actually you can do more than you think with Apple's built-in Preview, but PDFpen is the best value of price to features. It's definitely best for when you're making PDFs from scratch. PDFpenPro lets you create ones that have places for people to fill in details and it will make those be interactive. So your recipient can get a drop-down menu with selections of what to put in particular parts of the form. You or they can also sign documents and you can edit images. When Eric Heisserer wrote Arrival and would send PDF copies to people, he inserted images that he couldn't or didn't know how to add in his word processor. If he wrote on a Mac, he could've used PDFpen to just drag those images in. You can also genuinely redact information. Where some PDF editors slap a black box over text you don't want read, PDFpen will do that but also actually remove the text too. So someone OCRing the document can't just remove that black box layer and see what was there. PDFpen is also particularly good for when you're working on a complex document with other people. If they send you a PDF, you can annotate and comment and add or redact before sending it all back to them. The same applies to yourself when, for instance, you're editing a screenplay or manuscript. Even though you can make new PDFs within PDFpen, the focus of the app is really on working with existing ones. It's more that you know what the document is or what it's going to be rather than, say, you're exploring ideas and working toward something else. If you want to explore then LiquidText is a better PDF tool but PDFpen is the app you'll use to make documents to send to people. 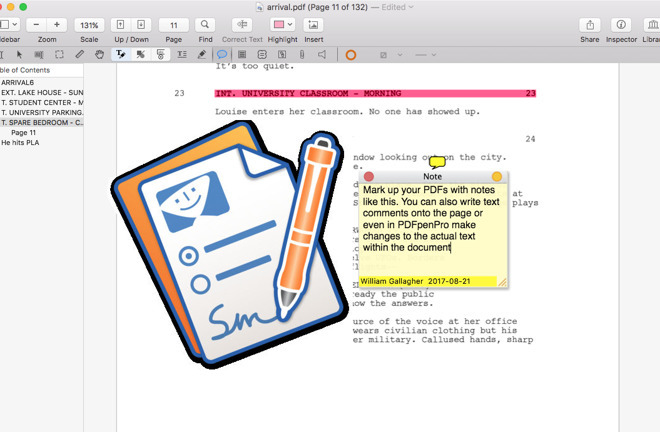 The basic PDFpen 9.1 costs $74.99 in the Mac App Store. PDFpenPro 9.1 adds interactive forms, editing text within PDFs and the ability to edit a Table of Contents for $124.99. Both versions are also available direct from the developer.